A lot of people wrongly assume that the best motorcycle helmets for women only differ from those of men in the area of color and style. Women’s faces are narrower and the diameter of their head is also smaller. This means that the size measurements for men and women motorcycle helmets are entirely different from each other. Thus, while shopping for the best bike helmet for women, the factors remain the same but their application turns out to be different. Most manufacturers take into account the bone structure of women’s faces and heads while making motorcycle helmets for women. The following guide would be extremely helpful to you in finding out about the best women’s motorcycle helmets to make your journey on the road even more comfortable, safe and adrenaline-fuelled than before. This women motorcycle helmet might seem quite basic in its features on the first view but it has some qualities that set it apart from other options. Better Fit Than Custom Helmets – The fit of this helmet is far superior to any other model out there because of the adjustable cheek pads that fit inside the helmet. If you manage to find the right crown size, you would never go back to another model. Retractable Sun Visor and Face Shield – The sun visor has an anti-fog feature to help you during those pesky weather conditions. The face shield takes around 10 seconds to remove and is simple enough to operate. There is also a breath deflector in this helmet. Multiple Advanced Vents – There are 4 vents for intake in this helmet and 6 more for exhaust. The front and rear vents are adjustable and make this helmet amazing because you can feel little to no heat when you are wearing it. The back vents are there to reduce humidity and improve circulation. 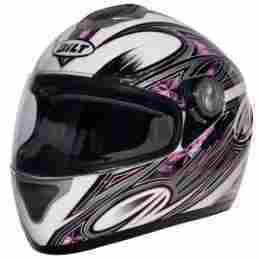 Most girl motorcycle helmets come with bright and cute patterns and not all women are fond of those. 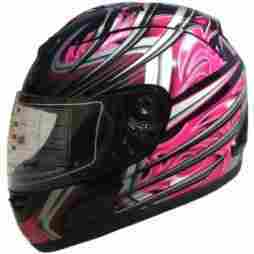 This is a black and very gender-neutral style of helmet that would appeal to women who like their helmets to be fuss-free. Adjustable Padding System – There are 5 pads made from foam inside this helmet that allow the rider to adjust the interior depending on their own face shape. The thickness is between 2mm and 4mm. Noise Reducing Ear Pocket Liner – There is a liner around the ear pocket of this helmet that helps to reduce noise during rides. It is removable and a sound system can be fitted in its place. High-End Venting System – There are three vents in this helmet – one at the top, another at the chin and an additional exhaust vent. The top vent can be kept open but it would increase the noise levels inside the helmet. Great Visibility – The eye ports of this helmet are large in size which makes visibility a breeze. The helmet is quite lightweight. If you are out researching women’s motorcycle helmets and are not afraid to spend a bit more, this model by Shoei is easily the best option to go for. SNELL Rating – With the most stringent safety standard backing it up, RF-1200 is as safe as you can go when you are riding on rough roads. Complete Fit and Adjustability – The price tag with this helmet might be high but it brings perks like customization. This helmet can fit any female head shape and there are 6 configurations to the EPS liner inside it. State of The Art Venting System – As expected from a Shoei helmet, the venting system is completely innovative and revolutionary. There are 4 rear vents that change the airflow depending on the position of the wearer. The defroster vent located at the lower end reduces any chance of fogging on the shield and increases circulation. Face Shield – The face shield can be sealed off completely when the weather is bad or it can be popped a bit to the front when more ventilation is needed. This is one of the best value motorcycle helmets for women because it nicely balances the price with the features offered. Different Sizes For Cheek Pads – There are different sizes of cheek pads that can be used for customizing the fit of this helmet. These pads are removable and so, you can wash them to keep the inside of your helmet clean all year round. Advanced Ventilation – This model comes with the unique ventilation system quintessential to HJC helmets. There are chin and top vents that are used for regulating moisture and pulling these pesky elements over the head. Exhaust vents are located at the back and work well with the moisture wick in the interiors. Tool Free Face Shield – Apart from a tool-free replacement of the face shield, it is also equipped with an anti-fog feature that gets activated with its pin lock system. A lever lock keeps the shield in place. SNELL and DOT Rating – SNELL and DOT standards are met up to size 3XL and beyond that size, the helmets adhere to the DOT standard. Shoei Neotec is already one of the best helmets on the market and the sheer variety of sizes make it a great women’s motorcycle helmet as well. The wine red color greatly appeals to women and is visible enough to make for a safe ride. Modular Helmet – This is one of the best modular helmets in the market with sizes ranging from extra small to double extra large. Advanced Aerodynamics – The aerodynamics of this helmet reduce fatigue to the lowest levels and the field of vision of this helmet is also quite large. There is no noise while wearing this helmet and women would also enjoy the sun shield that would protect them from the harsh glare of the sun. Face Shield and Chin Bar – The chin bar works with a flip up mechanism that is easy to operate and makes life fuss-free on the road. 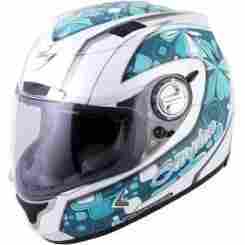 The face shield is mobile which makes this one of the top full face motorcycle helmets for women on rough terrains and also, half face when needed. 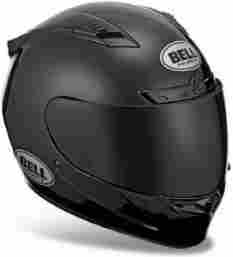 This model by Bell is one of the most affordable women’s motorcycle helmets, especially considering the features that come with it. Advanced Ventilation System – The ventilation system of this helmet works using the Velocity Flow technology and stability is improved using FlowAdjust. Riders also get to enjoy minimal buffeting and noise along with temperature control feature. Removable Liner – The comfort liner inside the helmet is anti-microbial and anti-bacterial in nature. It can also be removed and washed to ensure that the helmet always smells fresh and is clean. Wind Collar – The unique wind collar of this model is padded and helps to block the noise of the road and the wind, especially at high speeds. Speaker Pockets – This model can be equipped to have speakers as separate speaker pockets have been provided by Bell for those people who love to listen to music on the road. Tool Free Replacement – With an amazing variety of shields with features like fog-free, scratch free and UV protection, Bell has also introduced the utility of tool-free replacement and removal. 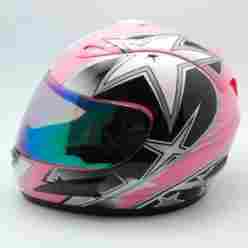 This X4 model might look like one of the many female motorcycle helmets with its pink color but it is actually one of the best women’s full face motorcycle helmets because of its features. 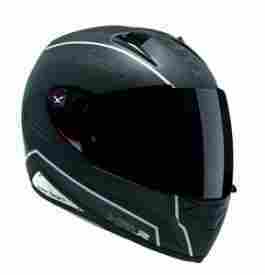 Strong Polycarbonate Shell – The shell material is an important factor to check while buying a helmet and X4 does not disappoint with this DOT certified helmet in that department. The polycarbonate shell holds its own during accidents, as remarked by many reviewers of the model. Affordable Price – This is a basic helmet that doesn’t promise fireworks. It does, however, fulfill all the promises it makes and the best thing about it is its affordable price. Removable Liners – The liners of this helmet can be removed with ease and are washable. Regular washing would ensure that the inside of the helmet always smells fresh and there are no bad odors from sweat and humidity. Lightweight and Comfortable Fit – The helmet is quite lightweight which is a plus because it fairs well aerodynamically. WOW makes some great women’s motorcycle helmets because they offer great designs with easy usability and unique features to their customers. DOT Approved – These helmets are all DOT approved and since they cover the most common sizes, it is extremely safe for street bikers to use this model by WOW. Thermoplastic Shell – The helmet is pretty lightweight because the shell is made using high-grade thermoplastic alloy. It is also aerodynamically superior which means that wind resistance is minimized using this helmet. Anti-UV Finish – The finish of this helmet is glossy and the design is beautiful but more than that, the paint is UV protectant and thus, it wouldn’t fade due to the sun’s rays. Removable Padding – The padding inside the helmet not only helps to ensure an optimal fit but WOW has made it easy to remove. The padding is also washable which ensures that sweat doesn’t cause a bad odor inside the helmet. Power Gear is another affordable brand known for making efficient helmets for women that can be bought without drilling a hole in the budget. Lightweight, Strong Shell – The shell is an alloy of thermoplastic and works well on long rides when the sun is beating down hard. It is also extremely durable and lightweight because of its material which ensures that the neck and shoulders don’t hurt. Removable Linings – The linings of the helmet can be removed and adjusted for the best fit. They can also be washed to ensure clean and fresh smelling interiors all the time. 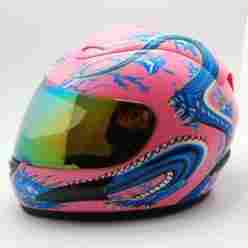 UV Protective Finish – The finish of the helmet is extremely glossy and the pink dragon design is appealing. 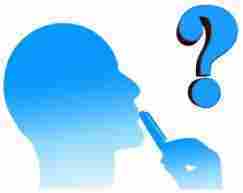 It is also UV protective in nature and would not sustain damage due to the sun. DOT Approved – As far as safety goes, this street bike helmet ticks all the boxes as it is DOT approved. There are two sizes available – Large and Extra Large. 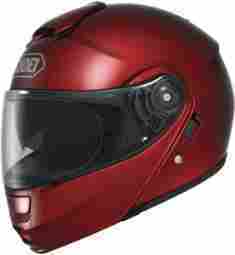 Some of the best motorcycle helmets for women are made by BILT and this is a trustworthy brand to go for, if amazing quality is desired. The features are great enough for the price. 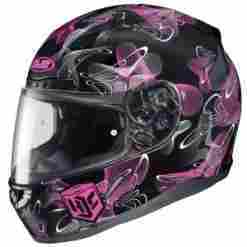 Full Face Helmet – This is a full face helmet for those women who want safety to be their top priority. As such, this DOT approved helmet would protect the head, face, and neck from any impact. It is also quite durable because of its polycarbonate shell. Advanced Ventilation System – The advanced ventilation system of BILT has been included in this model as well. 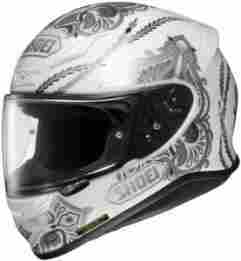 There are crown, chin and exhaust vents in the model facilitating superior ventilation inside the helmet. Removable Lining – The lining of the helmet is removable and washable. It is two toned and is made using airflow technology. Top Quality Shields – The standard clear shield works using a quick release feature that allows drivers to remove it when needed. There is also a sun shield in this model that is tinted to protect drivers from the harsh glare of the sun. Are you tired of the same old helmets for women? They neither have a great design, not superior functionality. Then you should choose from the best women’s motorcycle helmets mentioned in the above guide and make your life on the road a lot safer and fun. When you choose a helmet, you should take note of important factors like safety standards, inner lining, ventilation system, coverage and protection, and also, fit and comfort. Never buy a helmet that is too loose or too tight because it will ruin your driving experience. As a tip, you should always buy the best that you can afford. If you have made your decision, buy your best helmet now and say goodbye to helmets that cause you grief.